My name is Nertha Gaal and my hobby is creating dollhouse miniatures. I worked in the 1:12 scale for about ten years, until I came down with Micro Eye Syndrome (MES for short). Although we live in opposite coasts of the USA, I got infected by my dear friend, Anita McNary, about 5 years ago and have been a happy MES Sufferer ever since! Since in the 1:144 scale 1 inch = 12 feet, it means that I can create miniature worlds that can be held in the palm of my hand. 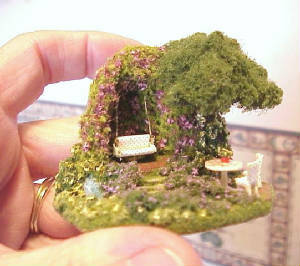 The Hideaway scene pictured here was built on a 2 1/4" diameter wooden base. If you look at the scene carefully, you can actually observe what some of the symptoms that those of us who are MES Sufferers exhibit. For instance, I suffer from hallucinations that cause me to envision half a walnut shell as a garden grotto, tiny pebbles as rocks for a pathway, a tiny bit of L shaped molding as a swing, tiny beads as flower pots. Well, you get the idea -- and perhaps now you understand how appropriate the initials for this condition are, since my supply drawers tend to be a mess with all the salvaged components I hoard ... I mean ... store in them! Click on photo to initiate magnifying glass feature.